The Rajiv Gandhi National University of Law, Punjab (RGNUL) was established by the State Legislature of Punjab by passing the Rajiv Gandhi National University of Law. Application form for eligible candidates are invited for admission into B.A. LLB (Hons) Five year integrated course and LLM one-year post-graduate course for the academic year 2019. Candidates will be informed regarding RGNUL Admission through CLAT 2019 as per the official declaration. Candidates can check the complete information of RGNUL Admission through CLAT 2019 like application process, eligibility criteria & other information through this page below. Latest: RGNUL has released information brochure for the CLAT 2019, scroll down to check the same. Candidates who are seeking admission to B.A LLB (Hons) and LLM course can fill their Application form from the official website. Admission will be made on the basis CLAT merit. The Admission through CLAT 2019 will be notified as per the schedule. 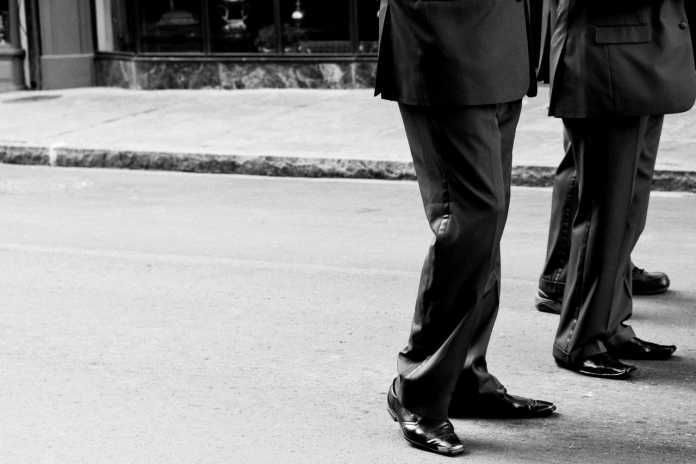 candidates are requested to keep a constant touch with us. Availability of Application Form to be announced! The last date to fill Application Form to be announced! Date of CLAT to be announced! Counselling Date for NRI and Foreign National category to be announced! The candidate must have passed 10+2 examination of the Punjab School Education Board or it’s equivalent with minimum 45% marks in the aggregate (40% marks for SC/ST). The candidates appearing in or awaiting results of the qualifying examination held or being held in March/April 2019 may also apply and appear for the Combined Law Admission Test (CLAT) provisionally, subject to the condition that they shall produce the proof of having passed the qualifying examination with the prescribed percentage of marks at the time of their interview/counseling. those who get compartments/re-appear in any subject in the qualifying examination shall be canceled and subsequent securing qualifying marks shall not be considered in any case. Candidate applying in the SC/ST/SAP/State Resident category is required to submit category certificate from the competent authority. 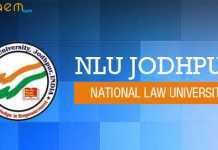 The Rajiv Gandhi National University of Law will release the application form. Candidates have to ensure their eligibility criteria before filling the Application Form. In order to take Admission for the academic year, 2019 candidates are required to provide their basic details. The direct link to fill the Application Form will be available here for the sake of candidates. All those candidates who fail to appear personally along with the requisite documents shall forfeit their right for admission and the vacancy created by this forfeiture shall be filled from the waitlisted candidates in order of CLAT merit. CLAT 2019 Admit Card (if applicable). 10th Pass Certificate and Marksheet. 12th Pass Certificate and Detail Marksheet. Migration Certificate from School/Board/University last attended. Character Certificate from Educational Institution last attended. Category Certificate issued by competent authority (if applicable). If gap year-declaration to the effect that student has not taken admission during the period in any Institution/University. Copy of Aadhaar Card (UID). Soft copy of Passport Size Photograph (jpg) in a Pendrive. One set of Attested Copies of the documents mentioned from I to X (Self Attested). On the basis of merit from the expression of interest received from applicants for admission to B.A.LL.B (Hons. ), the candidates have been provisionally offered seats against the existing vacancies. The candidates are required to report for admission at RGNUL Admission Office along with supporting documents in original and full fee as notified. 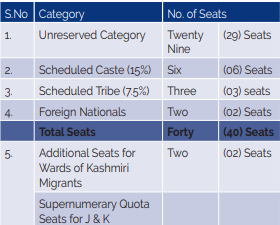 Note: The Vacancy against Ward of Kashmiri Migrant Category is only available in LL.M. course. 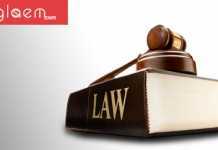 There is no vacancy in this category for B.A.LLB (Hons.) course. 05% (i.e. 09 seats) for Specially Abled Persons (SAP). 10% (i.e. 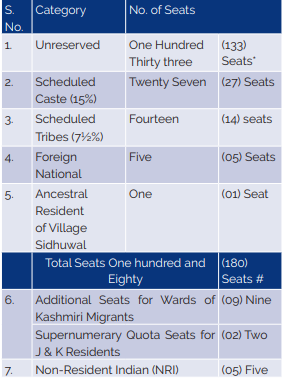 18 seats) for Punjab Residents. The candidates applying in the SC/ST category are required to submit the caste certificate from the Competent Authority. The eligibility of Specially Abled Persons (SAP) category candidates seeking benefit of reservation for Persons with Benchmark Disability/Disability shall be determined as per provisions of the rights of Persons with Disabilities Act, 2016, on submission of certificate of disability issued by the Designated Certifying Authority. (For further details (x) Seats for Kashmiri Migrants and Supernumerary Quota Seats for refer to the relevant provisions of the Rights of Person with Disabilities Act, 2016. 5% (i.e. 02 seat) Horizontal Reservation is available for Specially Abled Persons (SAP). The admission to foreign national students shall be on the basis of inter-se merit of the qualifying examination and interview. Foreign national students need to apply directly to the Registrar RGNUL latest by May 31, 2019. Five additional seats shall be offered in the Under-Graduate Course B.A.LL.B. (Hons.) FYIC only for Non Resident Indians (NRI’s). The NRI sponsored candidates shall not be eligible for admission under this category. The term Non Resident Indian (NRI), shall be as per the Income Tax Law of India. 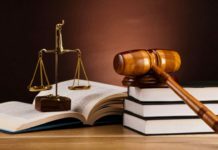 However, not withstanding any amendment in such laws, all rights, obligations and duties flowing from the Law and subsisting at the time of submission of the application shall be respected and mandated till completion of the B.A.LL.B.(Hons.) Course at RGNUL by the applicant. Non Resident Indian (NRI) shall also include their spouses, dependents sons/daughters inclusive of legally adopted children. Save as provided above NRI sponsored (popularly termed as “NRI SPONSORED CANDIDATES”) shall not be eligible for admission at RGNUL, Patiala. NRI Certificate issued by the Indian embassy in the concerned country. Copy of the Passport of Parent working abroad/Copy of the work Permit/License to work of parent/copy of resident Permit of Parent/ Letter from employer of the parent. English Translation of all documents & transcripts duly attested. Undertaking of Parent for financial support to the candidate including and payment of fee as prescribed for NRI category, by RGNUL. 2. 1 Year students are required to deposit two Demand Drafts, in favor of Registrar, RGNUL, Punjab, Payable at Patiala, preferably of State Bank of India. One draft for University Fee of Rs. 86000/- (after adjusting counseling fee of Rs. 50000/-) and second for Rs. 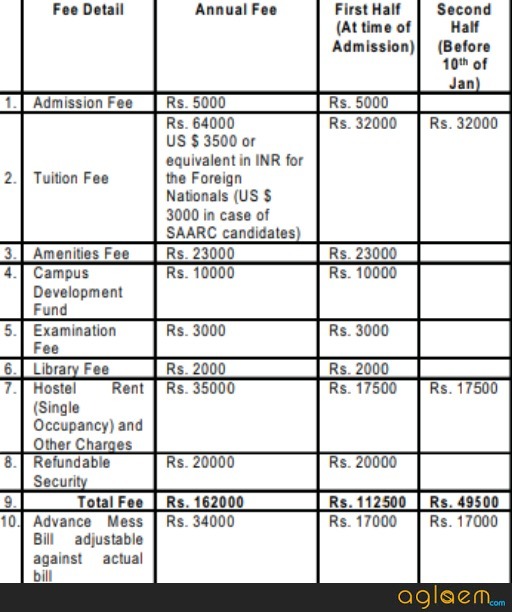 17000/- as advance mess fee to be paid at the time of admission. 3. All students of 2 semester to 10 semester shall pay the fee and other charges online. 4. **Single Occupancy in the Hostel, if available, will be allotted as per University Policy to senior students on the basis of merit. The charges for single occupancy shall be Rs. 35000/- per annum. Students are required to deposit two Demand Drafts, in favor of Registrar RGNUL, Punjab, Payable at Patiala, preferably of State Bank of India. One draft for University Fee of Rs. 62500/- (after adjusting counseling fee of Rs. 50000/-) and second for Rs. 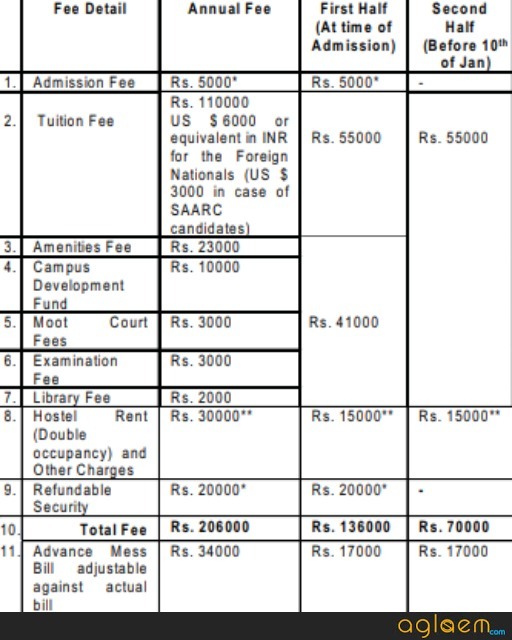 17000/- as advance mess fee to be paid at the time of admission. 2. For the second half, the fee payment shall be paid online. The form for fee payment is available on the website of RGNULwww.rgnul.ac.in. For more details of RGNUL Admission through CLAT 2019 – Download Information Brochure.